Electric Vehicles (EVs) have taken off in 2017 with governments, manufacturers and industry queuing up to announce bold commitments, product launches and sales figures. Suddenly, EVs have shifted from being a future technology, to a technology of the here and now. The next decade will be critical for EVs, and their accelerating deployment will have a significant impact on infrastructure systems and markets. A lot of attention has been given to ‘worst-case’ scenarios but smart charging technology means EVs can be managed to the benefit of the system, accelerating our transition to a sustainable energy future and supporting low carbon growth. 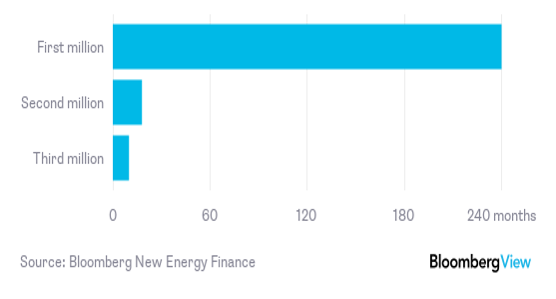 New analysis by Open Energi suggests that EVs could provide over 11GW of flexible capacity to the UK’s energy system by 2030. The next decade will be incredibly important for EVs, and their deployment has been strengthened by manufacturer commitment, government influence and price curves. Manufacturers including Volvo, Jaguar, and Volkswagen to name a few have made bold statements, claiming the electrification of their product lines and assigning large budgets for R&D. Global EV line-up will almost double by 2020, as the release of Chevy’s Bolt, Tesla’s Model 3 and Nissan’s new Leaf lead EVs into the mainstream. Governments such as France and the UK have agreed to ban sales of diesel vehicles by 2040. Other countries have set aggressive sales targets, for example China, who has set a 7m target in its 2025 Auto Plan. And all want to become world leaders in EV technology. Here in the UK, BEIS has announced funding for battery and V2G technology development with further funding announced in the Autumn Budget. Technology development and manufacturing scale-up continues to drive prices down. Battery prices, which account for around 50% of the cost of an EV, have fallen more than 75% since 2010 and are expected to continue to do so at about 7% year on year to 2030. Analysis from both UBS and BNEF claims price parity will be achieved in Europe, US and China sometime in the 2020s, repeatedly accelerating the next million of sales. 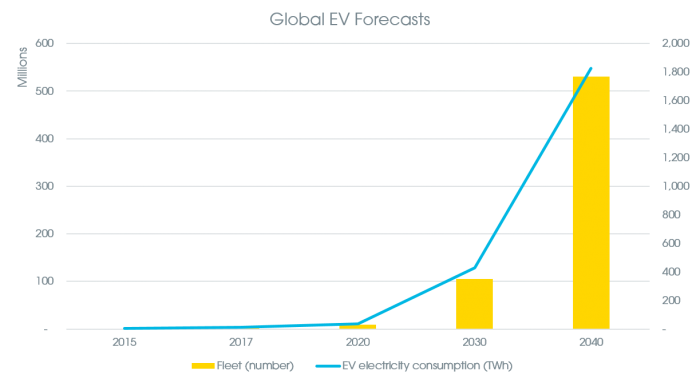 According to BNEF, in 2040 54% of global new car sales and 33% of the global fleet will be electric, with a demand of up to 1,800 TWh (5% of projected global power consumption). 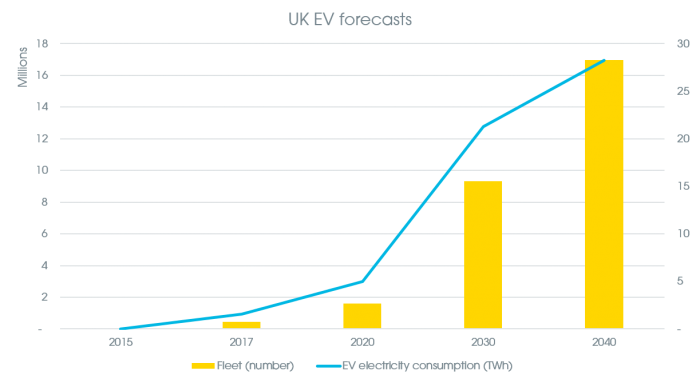 In the UK, National Grid suggests around 9 million EVs will be on the road by 2030. This uptake in EVs will have a significant effect on our electricity system. 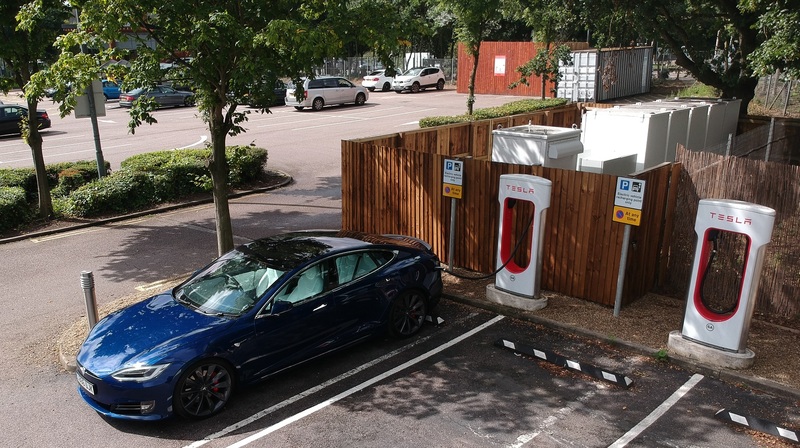 Although EV charging will cause an increase in overall electrical energy demand, the greater challenge lies in where, when and how this charging takes place. The overall electricity demand change will be a single-digit percentage increase but if all this energy is consumed at the same time of day, it could result in double digit percentage increases in peak power demand. This creates challenges for generation capacity and for local networks, who could be put under strain to meet these surges in power demand. There has been a lot of attention given to the worst-case impact EVs could have on the system – but less analysis of the benefit they could bring as a flexible grid resource controlled by smart charging. At Open Energi, we have used a bottom up approach to quantify the flexibility EVs could offer the UK’s energy system, and the opportunities it could create. Different charging scenarios were designed based on the charging speeds currently available and their granular flexibility was quantified (see below for a full description of the methodology). Then, the time at which each of these scenarios is likely to occur was evaluated. Finally, using EV fleet forecasts, volume was attributed to each scenario and a set of future flexibility profiles produced. 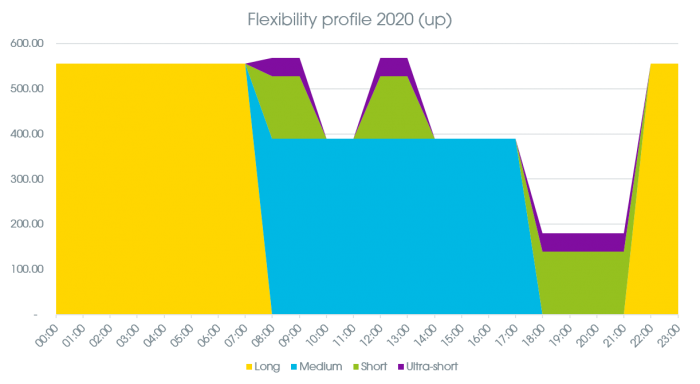 By 2020, with around 1.6 million EVs on the road, Open Energi’s analysis suggests there could exist between 200 – 550 MW of turn-up and between 400 and 1.3GW of turn-down flexibility to be unlocked from smart-charging. The available flexibility would change throughout the day depending on charging patterns and scenarios. In 2030, with 9 million EVs on the road, this rises to up to 3GW of turn-up and 8GW of turn-down flexibility respectively. Smart charging technology turns EVs from a threat to grid stability into an asset that can work for the benefit of the system. Optimal night-dispatch for example, can ensure all vehicles are charged by the time they’ll be used the next day without compromising their local network infrastructure. Cars could help to absorb energy during periods of oversupply, and to ease down demand during periods of undersupply. On an aggregate basis, they can help the system operator, National Grid, with its real-time balancing challenge, and provide much needed flexibility to support growing levels of renewable generation. Suppliers could work with charge point operators to balance their trading portfolios and manage imbalance risk, helping to lower costs for consumers. Of course, smart charging can only happen with the consent of the driver, and drivers will only consent if their car is charged and ready to go when they need it. 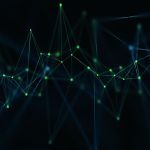 This means deploying artificial intelligence and data insight to automate charging without affecting user experience, so that the technology can learn and respond to changing patterns of consumer behaviour and deliver an uninterrupted driver experience. Getting this right is key to aligning the future of sustainable energy and transport. Open Energi’s methodology consists of a bottom up approach, looking at the different charging scenarios and quantifying the flexibility from each of them. The time at which each of these scenarios is likely to occur has been analysed. 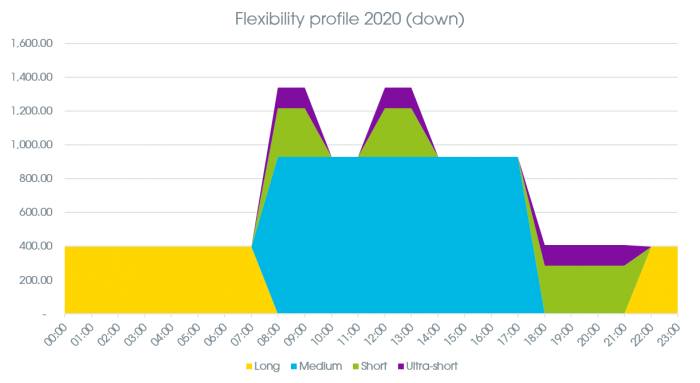 Finally, using EV fleet forecasts, based on National Grid Future Energy Scenario forecasts (2017, Two Degrees), we’ve attributed volume to each scenario and generated a flexibility profile. 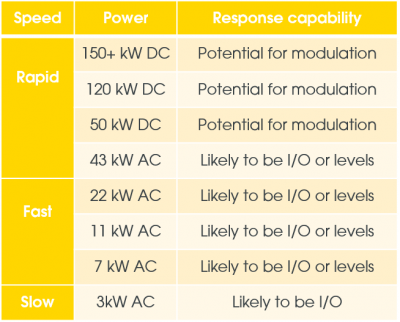 We formulated our charging scenarios based on the different charging speeds and the capabilities of each. Charging speeds are currently referred to as Slow, Fast and Rapid as set out below. Based on these speeds, we built some scenarios considering the use-cases. Slow charging is likely to be used at home, Fast charging in public spaces and Rapid in public spaces and forecourts. We assumed typical plug-in durations for these charging scenarios. This leads to the figures in table (above), which align closely with National Grid’s Future Energy Scenarios 2017 when using their fleet forecasts. Different likely situations were built for each scenario, using 7kWh as a simple rule of thumb of what an EV would require as charge per day. For example, for the ‘Long’ scenario: using a 3kW (B) slow charger, energy to be charged (A) was evaluated for the different likely situations (J). Potential turn-up (F) and turn-down (H) was defined and saturation/underperformance parameters (G & I) were introduced for this flexibility. That is, to charge (A) using speed (B), there would only be (I) hours of turn-down flexibility (H) in an optimal case before underperformance (i.e. not fully charging the vehicle). 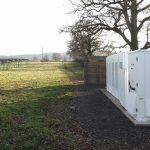 This was repeated across all scenarios using the range of charging speeds, plug-in durations and rates of charge eligible for each to quantify flexibility. The average flexibility potential for each possibility was calculated as a kW value, as the product of (F) & (G) and (H) & (I) divided by plug-in time (D). This was the estimated average kW value of flexibility for a vehicle under the option in the scenario. Max, mid and min flexibility values were defined for each scenario based on the options calculated per scenario. Long scenario (home charging) likely to take place during the night. Medium scenario (workplace charging) likely to take place during office hours. Short scenario (shopping/dining) likely to take place during early morning, lunch and after office hours. 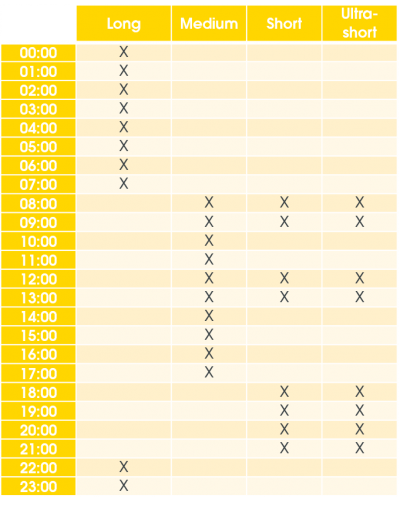 Ultra-short scenario (forecourts) likely to take place during early morning, lunch and after office hours. Attributing vehicle volume to each scenario was then performed as follows. Data from the Department of Transport indicates that approximately 50-55% of households owning a vehicle have access to off-street parking. Open Energi assumed the following share of vehicles per scenario. Further work needs to be carried out to define how this share will evolve over time with the development of charging technology. The aggregate flexibility for each hour which defines the profile was then calculated using the flexibility per vehicle and scenario, the scenario schedules, and the number of vehicles in each scenario and for each time period (2017, 2020, 2030 and 2040). Open Energi identified a gap in data available to define these shares with accuracy, these will have to be reviewed over time.